Looks like Billy Beane really is sticking to that Window. 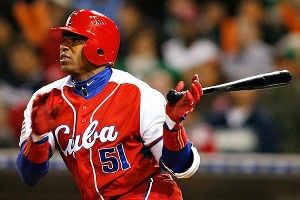 After spending the offseason trading away two of the better young starting pitchers in the game for a flock of prospects, the A’s shelled out big bucks for the most mysterious prospect since Toe Nash, signing Cuban slugger outfielder Yoenis Cespedes to a four-year, $36 million contract. Cespedes introduced himself to the world just three months ago, via a promotional video made by his agent Edgar Mercedes. It is not hyperbole to say that this is the greatest promotional ever done, on any subject, by anyone, in the history of the known universe. If you weren’t splayed out on your floor trying desperately to do a stand-up sit-up after watching this, you didn’t have a pulse. Here’s the video. Find a 20-minute break in your day to watch it. Trust me. ARE YOU FIRED UP YET?! Kevin Goldstein wrote a blow-by-blow account of the video in November that beautifully details Cespedes’ various acts of leaping tall buildings in a single bound. If Eastbound & Down doesn’t incorporate a Cespedes-type character into a future episode, I’ll be sorely disappointed. Of course the bigger question is, can the guy play? Tough to say. It’s difficult to evaluate the quality of pitching Cespedes faced in Cuba. He played briefly in the Dominican Winter League, and looked awful on a bunch of swings, but also showed glimmers of his raw natural talent. Overall, there just isn’t much in the way of accurate performance information here. He’s got tools, though. The Powerthirst quality of the video aside, Cespedes showed off a Bo Jackson-esque physique, and reports over the past few months point to a player with power, speed, and throwing ability. He’s at least got the starter kit to be a legitimate big league right fielder and hitter. The signing is also in keeping with the A’s high-risk, high-reward strategy when it comes to unproven commodities. Though spending has lagged on the major league payroll side, the A’s have been hyperaggressive with certain international signings. They spent $4.25 million to land 16-year-old Dominican pitcher Michael Ynoa in 2008, the highest bonus ever given out on an international pitcher signing. Ynoa’s development has stalled since then, but not for a lack of trying by his employers. The question is, when will he be ready to handle major league pitching — assuming he’s ever ready? Consensus has Cespedes needing at least a few months in the minors to adjust to new levels of competition. He’s listed at 26 years old, around the age when many major league hitters start to hit their peak. The hope is that he’s got a quick learning curve so he can jump into the A’s lineup while he’s still in his physical prime. Even if he’s fudging his age a bit, plopping a toolsy 28-year-old phenom onto a roster that’s crying out for impact players would be a terrific outcome for Oakland. Throw in that he’s the highest-paid Cuban player ever and the highest-paid player on the A’s this year even though he might just barely play. Which leads us back to the A’s goals for contention. The Rangers and Angels look loaded right now, and the trades of Trevor Cahill and Gio Gonzalez for younger talent likely wiped out the last, faint hope of the A’s passing their stronger division mates in the next year or two. But if you figure Jarrod Parker, A.J. Cole, Derek Norris, and the other players landed in those deals to be a couple years away from being viable big leaguers, and add some of the A’s existing young talent at the major- and minor-league levels, you can close your eyes and imagine a team that could compete in 2014 and beyond. That timetable would work even better if Cespedes can master the minors in the next year or so and be the middle-of-the-order bat the A’s want by next season. You almost need to look at this contract as a three-year, $36 million deal, assuming Oakland takes its time getting its new acquisition into big league-ready condition. The range of outcomes for Cespedes is gigantic, ranging from potential star performance to someone who washes out in a hurry. But the going rate for a win on the open market this off-season was nearly $5 million. That would mean Cespedes would need to be about a three-win player (or slightly less) over the life of the deal to earn the contract. Neil Walker was a three-win player in 2011. Can Cespedes deliver as much value as Neil Walker, albeit with a vastly different blend of tools and skills? Seems entirely possible. There could even be some bonus benefit here. Whose face can the A’s market right now to their fans, as they try to put butts in seats and bank other revenue streams? Coco Crisp? Kurt Suzuki? This guy? Yes, winning generally does a better job attracting fans and dollars than any one player can. But Cespedes is so hyped and mystiquey that he might be the rare exception to the team-over-player rule. If you’re an A’s fan, you have a very compelling new reason to go check out a game sometime in the relatively near future. After spending most of the off-season being fed another round of wait-’til-next-year assurances, this qualifies as welcome news. 'That's My MO, Bro': Randy Moss Is Back!